Right, so yesterday I was innocently eating lunch in a small park in a small village called Saint Leonard. This kid wanders over, watching me and my strange looking bike from a distance. He looked cautious, as if at any moment the tramp might pounce and devour him along with the pasta the tramp was cooking. “Bonjour.” They speak French here. The kid scarpered, running over to where his grandmother was sitting in her garden. Later I learned that Attila, the kid, had told his grandmother, Dominique, that I was French. I guess I should take that as a compiment on my French pronounciation. Dominique walked over the small park I had set my kitchen up in and introduced herself in good English. When she learned that I was going to be working in Anzere, she said I should stay at her place until I start. So that was yesterday. I met Dominique’s husband, Jean-Richard. I met their daughter (mother of Attila), Vanina. Jean-Richard is a keen cyclist. Today I spent the morning while Dominique was at work updating the blog, and in the afternoon we went with little Attila to Europe’s biggest underground lake, just 20m from where they live. As Dominique promised last night, tonight’s dinner was a Swiss delight. Grilled cheese fondu. 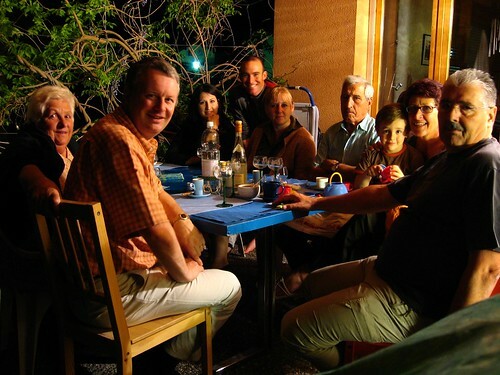 It was a regular family and friends affair, with four generations of the Gilloiz family present, plus some friends who had travelled in New Zealand. 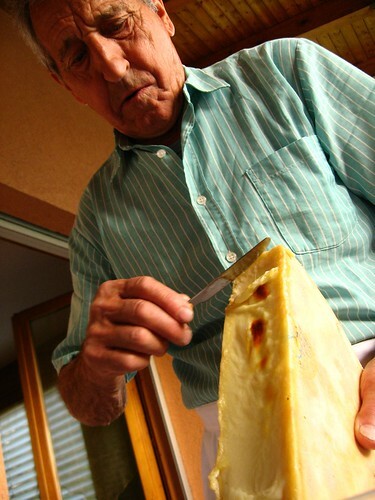 Dominique’s father, Remy (age 82, though you wouldn’t know it), did the melted cheese scraping. This stuff is such good cheesy goodness. Served with taters. You do fall on your feet with kind people to stay with! That cheese fondue brings back memories of eating sim,ilar when staying at Briener See (can't remember the right spelling) in 1980. I had a look at that underground lake – absolutely fascinating. Can't find St Leonard on the map so assume it's a tiny place. I have found Sierre and you're somewhere near there- also the Valais area. Never heard of grilled cheese fondue before but it looks just as delicious as the fondue done in a pot. I managed to find St Leonard on a map on the internet which stated that the Underground Lake was the largest of its kind in the world. Is it easy to get to? Mum, the underground lake is really easy to get to. They have about five small rowboats that a guide takes tourists on. Acces is via a small stairway. Even though it is the biggest in the world, it's still pretty small. I was expecting kilometers of intricate passages. But it's just a very large pond underground. About 300m long. Hey Rob, is that a special device that they grill the cheese on? You very lucky thing being able to eat real Swiss cheese. the best cheese in the world! The people you are staying with seem like a lovely family. Any Baptists in your facinity? Aunty Jenny, teh Swiss cheese is indeed fantastic. Dunno about Baptists around here. But they're pretty much everywhere, right? Ahh mate, great to see you "en Suisse". You are now in my old tramping ground. Enjoy. That was not fondue mate. you will have plenty of that in the next few months – I hope! (The best in the world is in La Fromagerie in Leysin). What you had was Raclette. 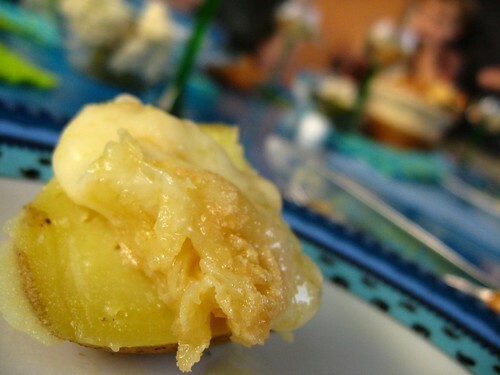 The raclette cheese is grilled on the special burner you saw, and scraped onto freshly boiled new potatoes, and served typically with Gherkins. V. yummy it is too. 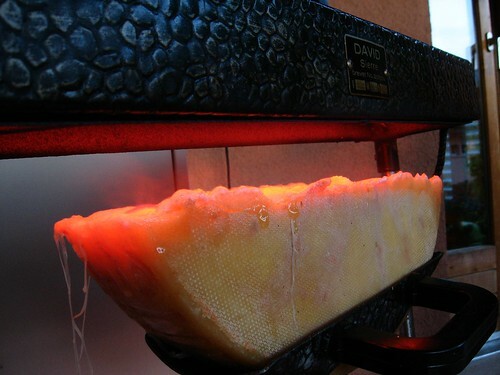 Just remember – golden rule of eating Raclette or fondue – steer clear of Beer! White wine will help you digest the cheese, but Beer will turn it into a glutenous lump of stodge that is best avoided, for reasons I wont go into here. If you are looking for some side trips… Take a deep breath and head up to Saas Fee or Zermatt – both on the same road… you can take a train from Brig or Sion(Home of the Knights Templar – viz Davinci code) via Tasch I think. Zermatt is home of the Matterhorn – and Saas Fee – the valley of the fairies, didnt have a road in there until the late 1940s – 6 families… all allegedly related!!! Eeek! Both are famous Valaisanne Ski resorts. Saas Fee has summer skiing on the Glacier, and I think the worlds highest underground railway! The other recommended jaunt is to the Chamonix Valley, Uphill from Martigny… and I mean UPHILL. it drops into France… not sure of the story about Kiwis in France these days… ?? But well worth a visit. If you make it, the MUST DO, is the Cable car to the top of the ADM – aiguille du midi (middle needle) – once at the top, take the elevator – yes elevator to the top observation deck.. or hook up with a guide for a day walk out on the Glacier.. I didn't warn you about the knife edge ridge ok.
Best to stay in Argentiere just before Cham IMHO. Aussies/Kiwis run "the Office" pub there. Enjoy the Rhone alps wine (ahem)… best IN fondue IMHO!! and at all COSTS, YOUNG SKYWALKER… AVOID drinking Cardinal beer. Your friends will thank me!